I promise you that you will be transported into another planet when you bite into one of these magical laddus! The sandy texture of the roasted semolina, the softness of the coconut, the chewy raisins and plump cashews infused with the heavenly and aromatic saffron and cardamom accentuated by sweet bursts of sugar create one of the most exotic and illustrious taste sensations ever! Lately I had this intense craving to create the perfect rava laddu! Unfortunately, the many ladies in my family who are all experts in making it were of little help to me as they all make these laddus by andaaza (approximation) and were not able to give me exact proportions. The two times I made it, although it tasted brilliant I had to resort to binding the mixture with milk as it had turned dry! Many folks use this method as an integral part of the recipe. Though good, the drawback is that it reduces the shelf life of the laddus. I wanted perfectly formed laddus without the help of milk and was finally successful in achieving what exactly I wanted in my third attempt. I always thought making this was tricky but have now realized that with a little practice and correct guidance it is quite easy! Not in a mood to make breakfast? Have these with a glass of milk or juice and some fruits! Do you want to feel elated and on top of the world while having your late afternoon or evening cuppa? Just pop one of these into your mouth! Want to pack an exotic hand made gift for a dear one? These are perfect! A celebration or festival nearby? They fit the bill perfectly! I made these for Lord Krishna on the occasion of Krishna Janmashtami (the lord’s birthday) along with a host of other delicacies! Each year I look forward to this festival as I’m in my elements trying to cook as many dishes as possible! I even went into making 108 preparations one year but the last couple of years following the birth of my baby I have just been a witness rather than an active participant in the festival! 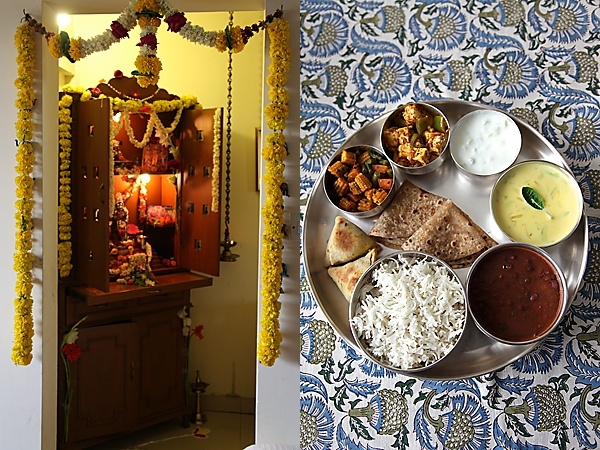 This year we slowly started celebrating again, decorating the deity room with lots of flowers and garlands, preparing lots of treats and sharing them with friends and family and performing the abhishek at midnight to mark the appearance of the lord! These laddus were one of the best preparations I made for this festival and now I no longer have to wait for the parcels to arrive to relish this all time favourite treat! I hope this brings to you comfort, contentment and bliss as much as it does to us! In a large bowl, mix the semolina and coconut, cover and keep aside for about 1/2 hour to 2 hours. In a wok, heat the ghee on a medium flame. After it melts, put in the semolina-coconut mixture, reduce the flame and roast until the semolina turns golden and plump, about 15 to 20 minutes. Make sure not to brown the semolina by continuously stirring it on low heat. Transfer the contents to a plate and allow to cool to room temperature. Put in the sugar and water into the wok and stir on medium heat until the sugar melts. Lower the heat after the sugar melts, add the saffron strands and cook until the syrup reaches one string consistency. You can test this by putting a drop of the syrup on a plate and allowing it to cool by blowing air on it and then taking the syrup between your forefinger and thumb and pulling it apart. At first the syrup is sticky and when the syrup draws a single thread its done! 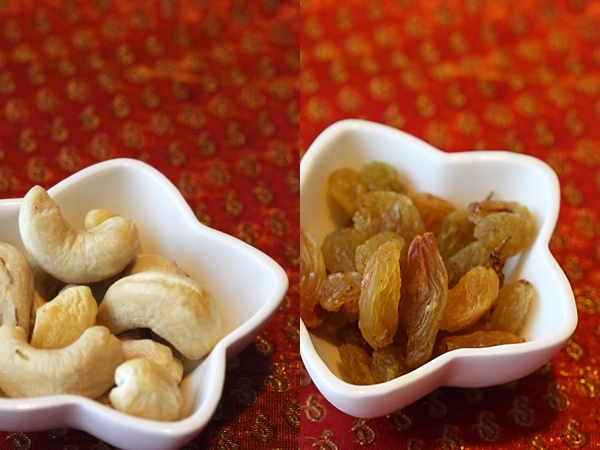 After the syrup reaches single thread consistency, turn off the flame add add the cardamom, cashews and raisins and the semolina mixture. Mix well, cover and keep aside for 20 minutes to half an hour. When the mixture is warm, form into laddus or balls by pressing small amounts of the mixture with your palms. Store in an air tight container. Use 1/2 cup ghee for the ingredients listed above if you want a soft consistency melt in the mouth laddu. This won’t harden even when refrigerated. If you use less ghee, the mixture might turn too dry to form into laddus. This can be sorted by adding a few spoons of milk until the mixture is soft enough to make into laddus. But, remember this will shorten the shelf life and might need to be refrigerated. Also the laddus are not very soft, but some people might prefer this texture to the softer one. If the semolina is roasted well then it can be stored at room temperature for 8 to 10 days. Refrigerate it for a longer storing period. Keep in mind that these laddus harden after some time! My husband rava laddus 🙂 I have never really made these as my MIL makes them very well but i would love to learn to master it! Wow..looks so tempting. I loove rava ladoos and my mom made a whole batch for my child's paalna. Gosh, how I miss these..however I remember amma doesn't add ghee at all and that's the main reason I used to love these fat free ladoos.I'll try your method minus the ghee and see if it works. Thanks so much for the ladoos.. Thanks for the tips and tricks… surely helpful!! Nice recipe. Just wanted to point out that you probably meant 'Andaaza' and not 'Andaaz'. The former means 'guess', while the latter refers to 'style' in Urdu. Haiya, what lovely pictures. Never had a rava-coconut ladoo. Away from home now, so cant do this. So beautiful! Thanks! 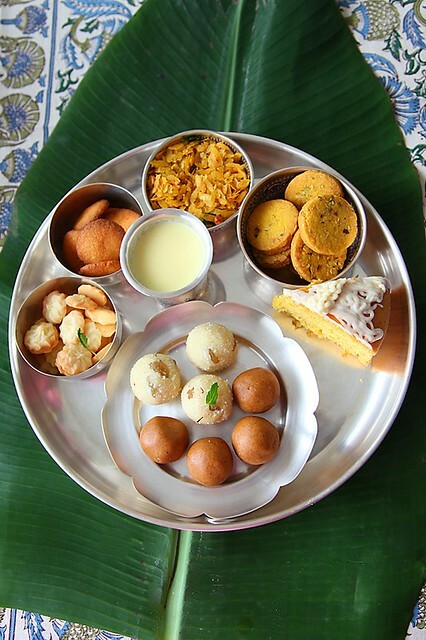 🙂 Btw, what are those brown laddoos in the thali, alongside the rava ones? I looked through your other recipes, the only one that came close in the looks department was the peanut laddoo. Here they look too smooth to be peanut laddoos – or am I mistaken? Archana: Oh dear..wish I could send some your way! I hope you do happen to try it though, once you are home! Reader: The brown laddus are the besan laddus! They are not the peanut laddus. The recipe for besan laddu is not yet up in the site! These are looking awesome and simple. Only thing I am nervous about is the sugar syrup bit. I am REALLY looking forward to making this for Ganesh and then for Diwali!! Love the semolina and coconut combo, my knees go weak for coconut! Thanks for sharing this recipe so beautifully. The cake looks decadent. Recipe idheya ? speedsere: My pleasure! Don't worry about the sugar syrup bit…you will get it right with the correct guidance! I wish I could write the correct temperature of one string consistency but my cooking thermometers (all 3 of them!) gave way! Let me know if you have any doubts though! And happy Ganesh and Diwali in advance! I hope these sweets brighten your festivals! sahiti: I'm so sorry to hear about your mum! I wish that this recipe brings back fond memories of her! What a wonderful recipe, very exotic and tempting! The pictures are just wonderful! Can I use oil or melted butter instead of ghee? Marian: Hello and thank you for your nice note. You can use unsalted melted butter but I suggest you don't use oil in this recipe. Ghee is nothing but butter melted and cooked until it develops a golden hue and nutty flavour. It has medicinal properties too. You can look up the net for a recipe to make homemade ghee. You will find a lot of uses for it. If not, use unsalted butter (melted). Hope your daughters relish this! My best! oh my…i need to try this out..i love rava and anything made from it……..thanks for all the lovely recipes that you are dishing out…. hi anu out of this world! transcendental.. I showed ammamma your website and some of your exquisite recipes . She was very happy They all look really delicious ,I am planning to make rava laddu as per your recipe for Ganeshchaturti. These are so beautiful. I cant wait to make them. I have bookmarked your recipe. I'm new here on your blog, I look forward to seeing some of your other recipes. Many thanks, Anushruti, for your reply and the tip. If I make it I will let you know! Many thanks for the recipe! Medhakka: thanks for showing this to ammamma! Hope your laddus turned out well! neha: As I have stated in the recipe, use fresh coconut i.e with water! 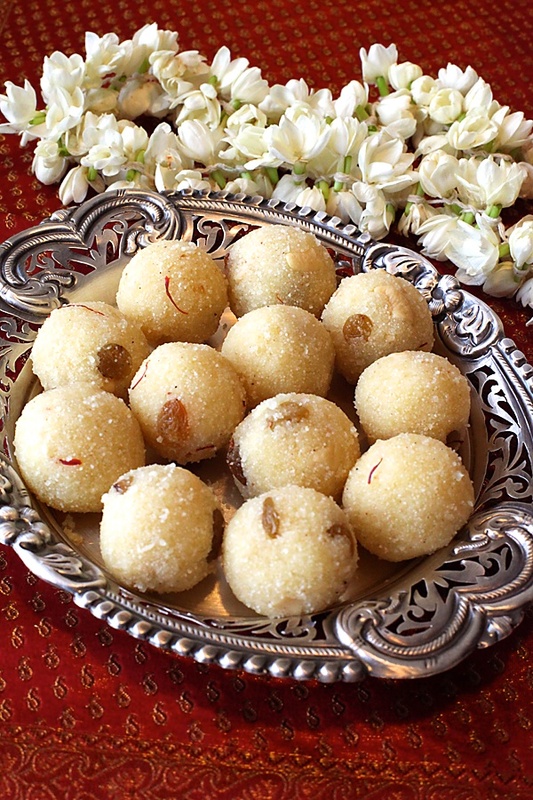 I love ladoos, but without ghee… Is there a possibility to prepare this recipe without it? By cooking the semolina in milk, for example? 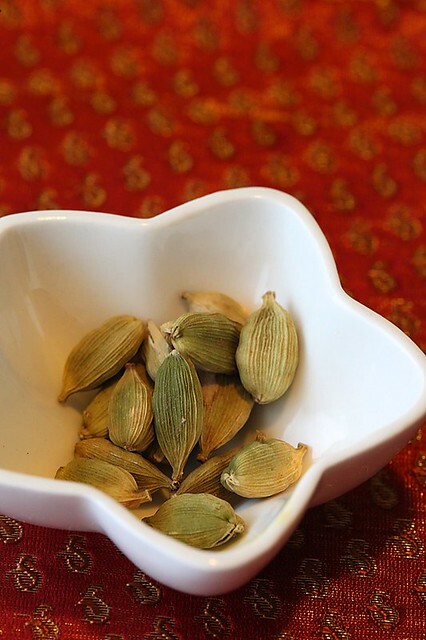 (I have a recipe for cashew almond walnut pistacio apricot ladoos flavoured with coriander, anise, nutmeg and cinnamon, which are prepared with milk and honey. That's were I got the idea from…) Many thanks for any good suggestion! Thanks for the lovely recepie and proper direction, made rava laddoos today and they turned out great! This is so simple and I didnt have any hassles whatsoever!! Can you pls post recepie with similar guidance for besan laddoo? I always mess it up either by insufficient roasting or burning my palms! Georgiana: There are many recipes without ghee for laddus but here it is an integral part of the recipe. Ghee has always been traditionally used to make these laddus. You could try using a flavourless oil like rice bran but I can't vouch for the taste and texture as I havent personally tried it. Bella: Have added your recipe request to my que. Request you to be patient. Thanks for reporting your success with this recipe. These are *so good*! I took them to work and they got gobbled up right away. They're a little too sweet for my taste, so next time I'll probably cut back on the sugar a bit, but even so they're the tastiest thing I've eaten all month. Hi Anu you reminded me of my mother,grand mother and our summer vacation where we would wait for my grand mother to just go to the storeroom and come out bowlful of these RAVE UNDE.. my childhood in Mysore..i surely want to give this to my childern…will make it soon..
my kids are having feast on it.. Thanks for posting the divine once again. bhuvana: These rava laddus are one ofmy most favourite sweets…so happy that you and your family enjoyed it. Hmm, just goes to show you that probably none of the commenters have tried this recipe because it mentions to add saffron at two points in the recipe – so when do you add it? Love yur alter. definitely going to try this receipe, it looks delicious. Tried out your recipe for the rava laddus and it was a hit. My attempts at making these laddus in the past have always been a huge flop. Thanks to your recipe, have mastered them at last. Thanks a lot. Mamta:I love hearing feedback on old posts and especially intricate ones like this. Glad it was a hit with you and your family! Tried your recipe today. Awesome! House smells so good! Family is happy. Couldn't ask for more. Bob, you probably didn't read properly. She mentioned the saffron in the directions. You add them once the sugar melts. Commenters DO try her recipes. raeshma: Thanks for your feedback! The house smelling good is one of the best parts of making these laddus. Hi Anushruti, wanted to say a big thanks to you for posting this recipe. I made these for my husband's bday yesterday and they turned out awesome. He's a big laddu fan and was very happy to have these on his day. Once again THANK U.
hey just came across your blog on www. beautiful pictures! was looking for some mithai to make for diwali puja and now i will make these…good luck to me! Thank for you for sharing this wonderful recipe! This is the first time i ever made ladoo and it was a complete success – thanks to your tips and additional notes! Thanks for the recipe.tried and really came out well.your proportions are perfect.thanks. Thanks for the recipe. I made the laddoos and have turned out perfect. This is the first time I have made any item with sugar syrup which needs perfect consistency. Also I added 1 cup of sugar instead of 1 1/2, still the taste is great. Thank you for the detailed recipe. Akhila: Great! That's so nice to hear! M & M: You are welcome. I made these today; first time ever!! They were PERFECT!!! Feeling like a pro… Now I don't need to wait for my mother or Ajji to make these for me 😀 Thank you Anushruti! 1) Can I use milk instead of water..I think that will make laddus more tastier. 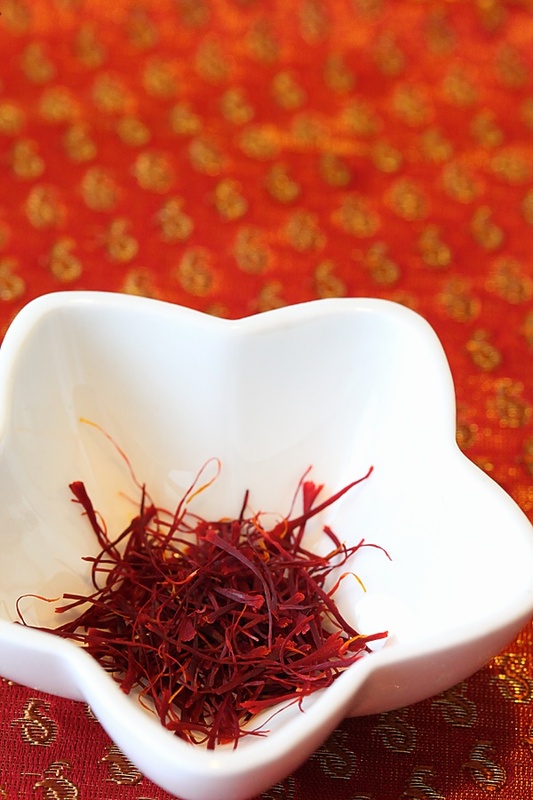 2) Is there any problem if I am not using saffron strands?? Sangeethga: Generally sugar syrup is made only with water and sugar to get the right consistency. You can skip the saffron if you wish. tried your receipe of rava laddo ….they were simply yumm …. can remember the decadent aroma! fail, woww I'm so happy. Finally I made this. We all liked this laddus. Poonam- Thank you so much for kind words. Made my day! Look forward to hearing more from you. I made these laddus as an offering for Lord Krishna. As this was my first attempt at making laddu, they were not perfect round in shape but close enough. The taste was awesome, Thanks to your wonderful recipe. Mayur Kudalkar- Awesome! The Lord will be happy with your offering, irrespective of the shape. Saw your video today for this recipe on you tube. My favourite part was you calling the bubbles in sugar syrup magical. I had all the ingredients on hand. So made them. I got the sugar syrup right! But unlike you, I couldn't admire the bubbles! I was concerned that I should get the one thread consistency right, as I don't have much experience with them. And I felt so happy that they turned out well. The taste: Difficult to stop at one, that speaks for itself! My husband liked them a lot! Thank you for the recipe. God bless! nageshwari-I can't tell you how I chuckled after reading your comment. 🙂 Thanks for the feedback and hope to hear more from you. I was searching for som yumm soft rava laddoos made with fresh coconut..nd ur recipe seems perfect. The way the recipe is explained nd the pics,is great! Im soo tempted and wanna make n eat them right away bt as is said the preparation time is quite long..sigh! But, Sabar ka phal meetha hota hain! So thank u soo much Anushruti. Shruti- Thanks! You can also look for the video of this recipe. Happy cooking! mina- Unfortunately this laddoo won't taste as good with dry coconut. This recipe needs fresh coconut. I always end up using dessicated coconut. Bhavana- I use freshly grated coconut. 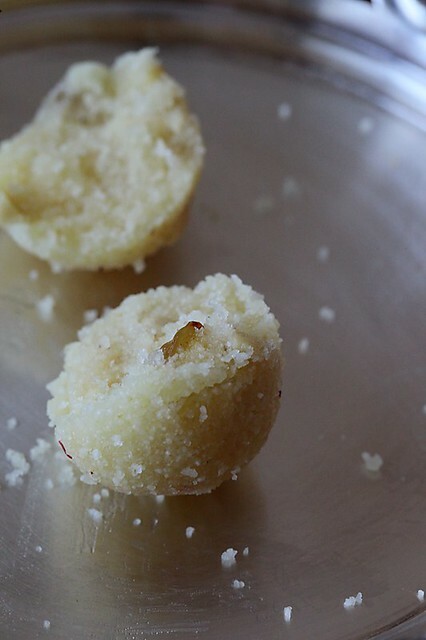 The moisture from the freshly grated coconut plumps up the semolina. If dessicated coconut works for you then you can use it, it might not be the same as mine but will still be delicious. Bhavana- Thanks for the feedback. Cooking time will reduce a bit. You need to keep an eye on how the ingredient changes colour. What is the quantity of milk of the mixture gets dry.. also warm milk or room temperature?? Anu- Use just a few spoons to milk, until you are able to bind. If you follow the above recipe to the tee, then your mixture wont get dry. Hi Anushruthi, best rava laddu recipe ever! I love the background music in the video. I can't quite figure out what this music is called. Could you please tell me? Thank you. Suma- Thanks. The music content belongs to the producer of this episode, Rajshri. Hi , i made them , they tasted awesome !! Felt so good eating them ..